Pay As You Earn (PAYE) was introduced in 1958. 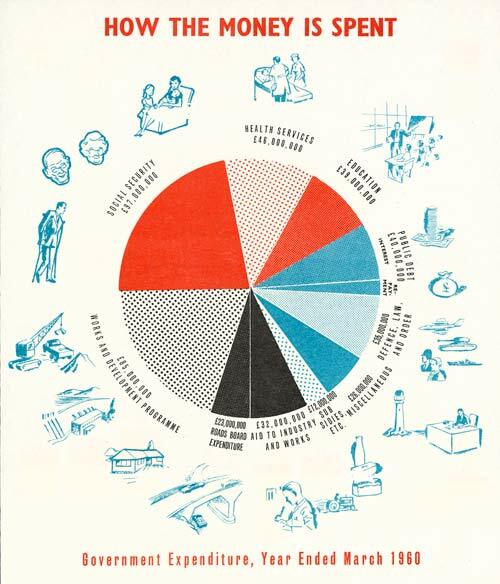 This page from a PAYE pamphlet shows where the government spent its tax revenue in 1960. Crown copyright Unless otherwise indicated, this material is protected by Crown copyright. You can reproduce this Crown copyright material free of charge without further permission, as long as you: •reproduce the material accurately; •do not use the material in a derogatory manner or a misleading context, and •acknowledge the source and copyright status of the material. There is no copyright in any legislation in this material.